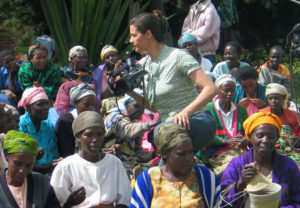 As a cinematographer Kirsten Johnson has shot films of the calibre of Fahrenheit 9/11 and Citizenfour; using outtakes and unused material from her work, Johnson reframes the footage associatively in the style of a collage, or visual essay to illustrate moments and situations that have affected her. The seemingly unconnected incidents include candid interviews with conflict survivors, a young boxer’s prep for a fight and home movies with her mother who is suffering from dementia. Johnson precisely orders these fragments to allow them to chime and comment on one another, building to a powerfully cohesive whole. Winner of Best Film at Sheffield Doc/Fest, Cameraperson pushes the boundaries of the documentary form, challenges our preconceptions and argues for new modes of expression. Inventive and profoundly moving, the film asks pertinent questions about the relationship between filmmaker and subject.